Perhaps no other food has been more closely identified with the Americas than corn. Both the Mayan and the Olmec civilizations that date back to 2000-1500 BC in what is now Mexico and Central America (commonly called Mesoamerica) had not only adopted maize as a staple food in the diet but had also developed a reverence for maize that was expressed in everyday rituals, religious ceremonies, and in the arts. The first domestication of maize in Mesoamerica actually dates back even further, to 9000-8000 BC. Corn was equally valued by Native American tribes living in North America, although tribal wisdom about corn was largely ignored by European colonists in the 15th and 16th centuries AD. By the time Columbus and other explorers arrived in North America, corn was already an integral part of Native American cuisine. However, many colonists ignored Native American traditions related to corn - including the pot ash tradition - and later fell victim to the vitamin B3 deficiency disease called pellagra. (When cooking corn and cornmeal, Native Americans had developed a practice of incorporating ash from the fire into the food, and the mineral mix in this ash increased the bioavailability of vitamin B3 from the corn. The addition of lime in the form of calcium hydroxide to tortillas still serves this purpose today. While the average U.S. adult does not share the reverence for corn that characterized the practices of Native Americans and indigenous peoples of Mesoamerica, there is still an amazing influence of corn on the U.S. diet. Forty percent of all processed, pre-packaged foods sold in U.S. groceries currently contain some processed component of corn, although this component is most often high fructose corn syrup (HFCS). Per capita consumption of corn in all forms is approximately 160 pounds in the U.S. (and approximately 60-65 pounds come in the form of HFCS). U.S. farmers grow about 40% of all corn produced worldwide. An important region of the U.S. is still identified as the "Corn Belt." This region is typically defined as including Iowa, Illinois, the eastern parts of Nebraska and Kansas as well as North and South Dakota, the southern part of Minnesota, and parts of northern Missouri as well as Ohio and Indiana. However, Iowa, Illinois, Nebraska and Minnesota remain the top producers of corn in the U.S. and provide over 50% of all U.S. corn crops. An increasing trend in U.S. production of corn has been cultivation for non-food purposes. Addition of ethanol to gasoline and biofuel production have been two important factors in the shift away from food-based cultivation of corn. The cultivation of corn for ethanol production has also led to an increased supply of ethanol by-products that have found their way into the marketplace. An example here is distillers dried grains, or DDGs. DDGs have already become an important part of livestock feed, along with other corn components. Along with the United States, other important commercial producers of corn currently include China, Brazil, Mexico, Russia, Ukraine, Romania, and South Africa. In skillet, over medium heat, add ground beef, salt and pepper, stirring occasionally, cook about 8 to 10, until no longer pink. Add onions and peppers, stirring, cook about 3 minutes. Add tomato sauce, corn, garlic and crushed red pepper, stirring, heat through. Stir in pasta. Sprinkle cheese. Enjoy! I cant get enough Southwest recipes these days just love the food this sounds great! Mmmmmm...this sounds like a wonderful, one pot dinner! This is a great time of year for a dish like this. Corn is certainly a major foundation of food culture here! This looks so good. Homey, comfort food! I so love good corn! 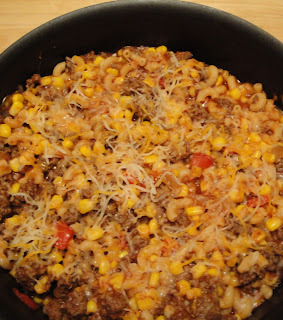 This looks easy and delicious--I'll try this the next time we get good fresh corn.